BEFORE booking your trip, please read this summary of the booking process: Reservations and Payment Explained. Enter your preferred start date and number of people above and proceed to booking. Trip prices vary depending on dates and will be automatically calculated. After paying your deposit, don’t forget to complete our trip reservation form. In 2019 we are running this trip for small groups on a private or custom basis only, on the dates of your choosing between early June and mid-October. 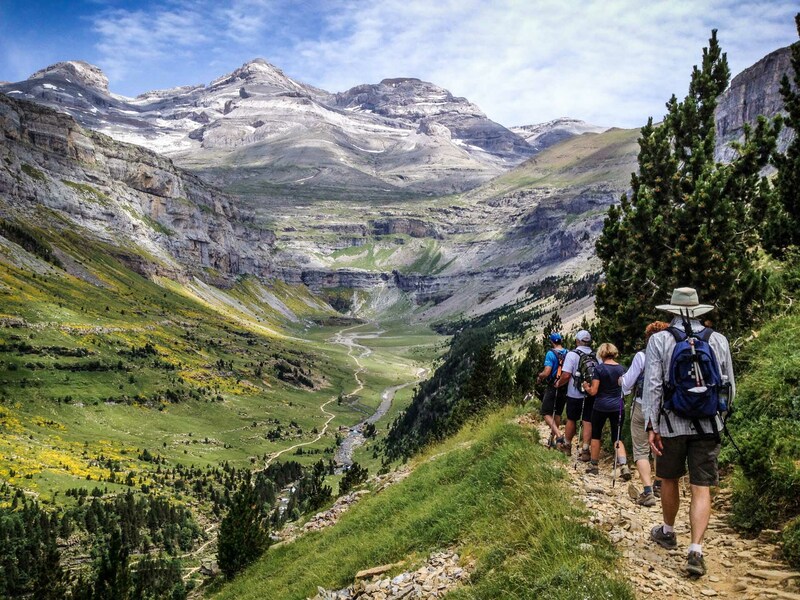 This tour explores both of Spain’s two very different national parks in the Pyrenees, both located in the biggest and central sector of the range: Cañones de Ordesa y Monte Perdido in the ancient region of Aragón and Aigüestortes I Estany de Sant Maurici, in the dynamic historic region of Catalonia. 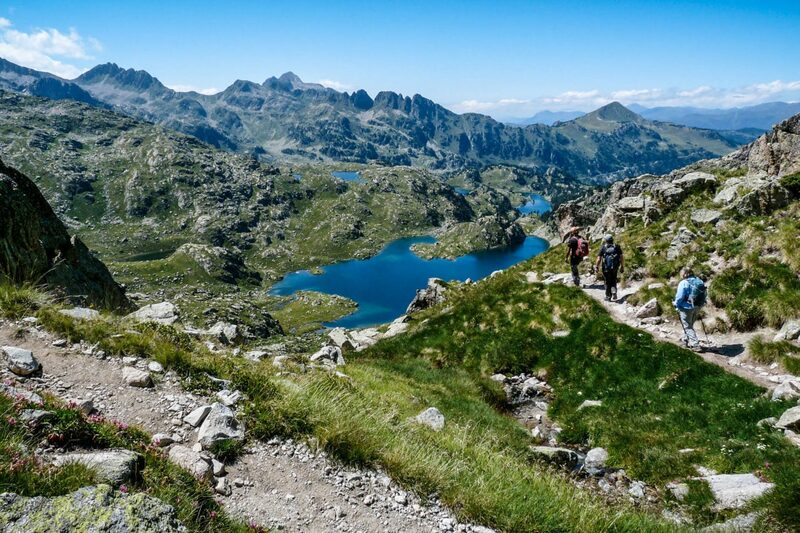 The Parc Nacional d’Aigüestortes I Estany de Sant Maurici is the crown jewel of Catalonia’s protected areas and the only national park within its territory. This is a wonderland of shapely granite peaks and hundreds of glacial lakes. The 1st 2 nights, you’ll be based in Taüll, in the Val de Boí, whose 9 Early Romanesque churches are designated as a World Heritage Site by UNESCO. 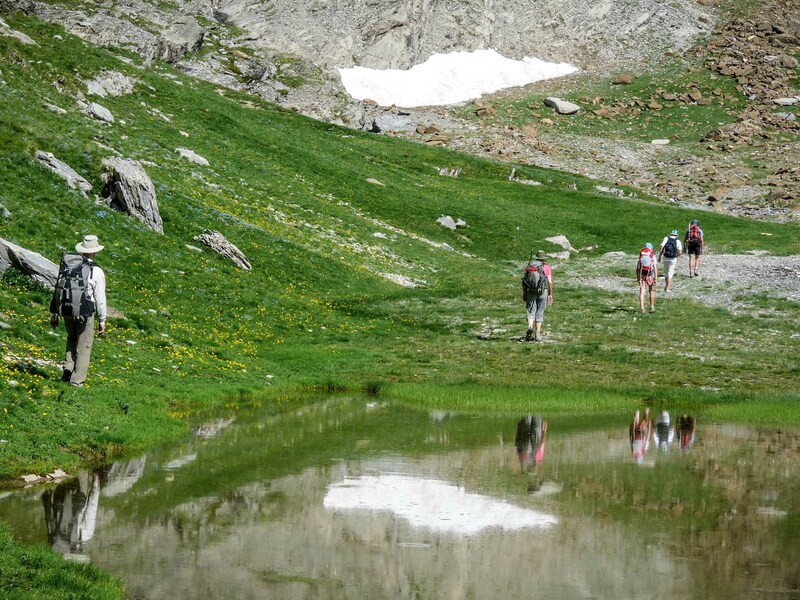 Here we explore the Western or Aigüestortes sector of the national park. Then we trek across the national park to spend 2 days based in the pretty stone village of Espot, our hiking base for the Western or Sant Maurici sector. A short drive east brings us to a completely different world, where we’ll be based in the quaint village of Torla, on the edge of the spectacular limestone canyons and mountains of the Parque Nacional de Cañones de Ordesa y Monte Perdido, part of a larger area designated by UNESCO as a World Natural Heritage site—spanning the contemporary national borders of France and Spain, centered around Monte Perdido – the 3rd highest mountain in the Pyrenees (and the highest limestone mountain in all of Europe) and including two of Europe’s largest and deepest canyons and three major cirque walls. In both national parks, you’ll hike ancient paths amidst rural landscapes leading into the wild heart of the mountains, allowing the visitor a fascinating glimpse into age-old customs and ways of life that continue into modern days. These areas preserve traditional landuse practices in which the relationship between humans and the environment evolved over the centuries in a balanced, intelligent and sustainable manner, for mutual benefit, an agricultural way of life that was once widespread in the upland regions of Europe but now survives only in this part of the Pyrenees. There will be daily opportunities for observation of fauna & flora, with sure sightings of vultures and other birds of prey, marmots and perhaps even the nimble rebecco or chamoix among others. In spring and early summer, there are wildflowers galore. 2* or 3* hotel in Torla. Our criteria always focus on quality of “character” (historical and/or traditional-style buildings where possible), location and service with a preference to local family-run enterprises. Good food is also a must! Contact us to request a quote for your custom or private group! Services of a bilingual tour leader/guide throughout the entire itinerary & certified local mountain guides on all hiking days. All transportation as specified in the itinerary – including Day 1 morning pickup in Barcelona or Lleida, Day 8 transfer to Bilbao, with stops en-route in Pamplona and San Sebastián. We’ll drop you off at your destination of choice. Parque Nacional de Aigüestortes I Estany de Sant Maurici, crown jewel of Catalonia’s protected areas and the only national park within its territory. This is a wonderland of shapely granite peaks and hundreds of glacial lakes. Glorious views, exuberant flora and abundant fauna: a nature photographer’s dream. This part of the central Pyrenees is one of the world’s finest locations for alpine flowers, including the famed Eidelweiss. Marmots and chamoix observe us from rocky perches and myriad birds of prey soar overhead, including the Lammergeier – one of Europe’s rarest birds of prey. Overnights in picturesque mountain villages: we sleep in pretty little medieval towns with ancient churches, cobbled streets and traditional architecture: Torla, Taüll and Espot. Romanesque churches of the Val de Boí: the 9 Early Romanesque churches in this valley are the densest concentration of Romanesque architecture in Europe, designated as a World Heritage Site by UNESCO. Sant Climent church, in the village of Taüll, is the finest example of all. Enjoy tasty cuisine based on fresh produce from the region’s agriculture, and if you enjoy wine, nearby areas produce excellent wines. Local cheeses & meats are particularly good. Begin in Barcelona: The most accessible international airport is Barcelona. Most people fly in a day or two early, allowing you to explore the architectural, culinary and cultural jewels of Spain’s most dynamic city. on Day 1 of our itinerary, we’ll pick you up at either the airport or your hotel…or in the town of Lleida, on the high-speed railway line to Zaragoza/Madrid, about 1 hour from Barcelona. End the trip in your choice of 3 of northern Spain’s most interesting cities. We’ll drop you off at the city of your choice: Pamplona – on the Camino de Santiago and famous for the Running of the Bulls during its San Fermin Festival; or one of two coastal towns in the Basque Country: San Sebastián, considered one of the county’s most beautiful cities or Bilbao, home to the Guggenheim Museum and an international airport. Arrival in Barcelona. Enjoy exploring this vibrant Mediterranean port city. Highlights include at least 8 architectural sites featuring the Catalan Modernisme Style which have been awarded UNESCO World Heritage status such as La Sagrada Familia, Parque Güell and Casa Milá. Don’t miss strolling the aisles of La Boquería—of one of Europe’s most colourful markets or the picturesque Ramblas street. If it’s your first visit, we recommend more than 1 night – ask us for hotel suggestions. You could also visit after the hiking trip. Morning transfer to the picturesque stone-built village of Taüll. Stop en-route for lunch. 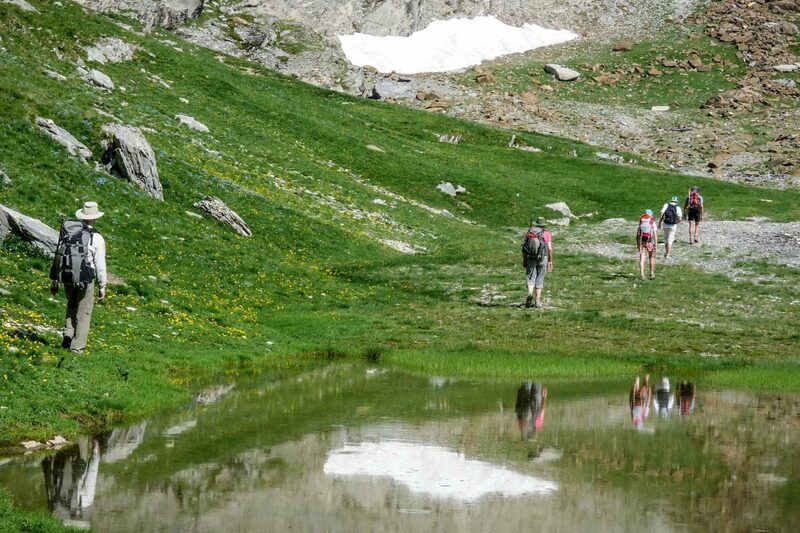 At 1489 m/ 4885 ft. above sea level, Taüll is in the Val de Boí a narrow, steep-sided valley that is a principal gateway to Aigüestortes i Estany de Sant Maurici National Park. The remoteness of this area is demonstrated by the fact that the Moorish Conquest of Spain did not penetrate this part of the Pyrenees. After checking in to our charming family-run mountain hotel, we’ll visit the superb 16th C Romanesque St. Climent church and then take our 1st hike, following ancient trails among vegetable patches, orchards and mixed forest to visit other quaint villages of the valley. 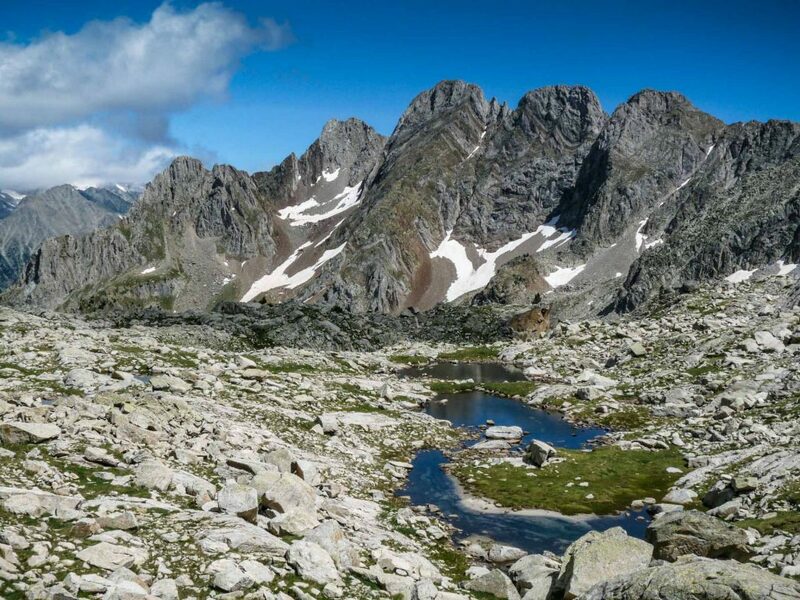 Our 1st full-day hike provide the perfect introduction to the granite and aquatic treasures of the Parque Nacional, whose glacial origin is evident in the labyrinth of meandering streams and over 200 lakes giving rise to its name “Aigüestortes” meaning “twisted waters” in the local dialect. 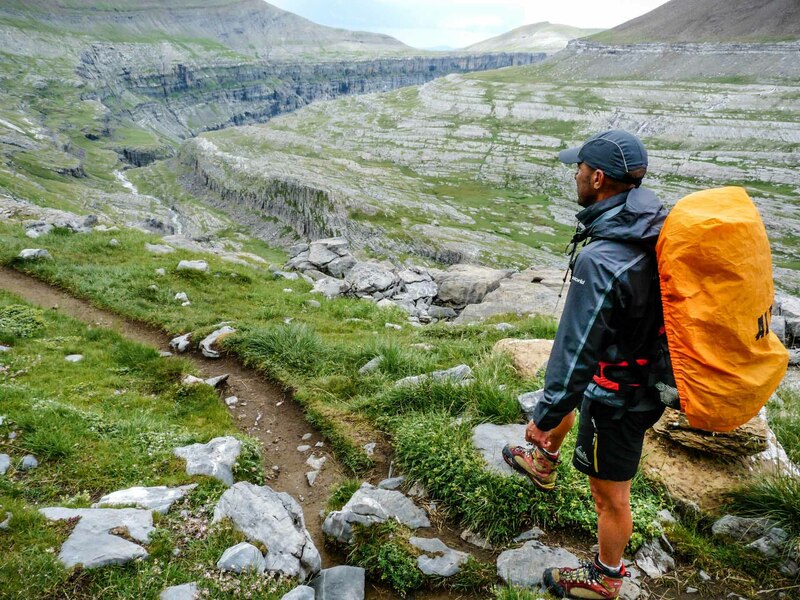 Our goal will be to reach a mountain hut spectacularly situated about a glacial lake, where you can drink a tea or coffee and chat with the warden. Short transfer to trailhead. Today you’ll walk from West to East to the other side of the national park to our new overnight base in Espot. This is a classic route that follows a section of the trail used in the famous “Carros de Foc” (Chariots of Fire) hut-to-hut race that is now a fixture on the international trail running circuit – created back in the 1980’s by bored national park mountain hut wardens during low seasons, as a quick way to go to visit each other . On today’s excursion we visit is one of the most intact and remote areas in the entire national park. We trek through black pine forests and alpine meadows, visiting glacial cirques ringed by rocky summits on our way to a spectacular viewpoint over Lake St. Maurici and the Les Encantats, the “enchanted” mountains. 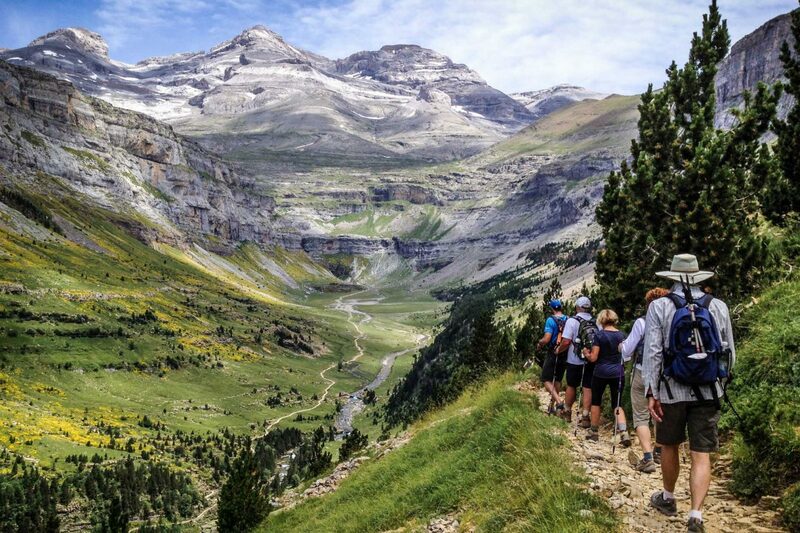 This morning we transfer into the heart of the central massif of the Pyrenees, to the pretty mountain village of Torla, the best entry point to Spain’s spectacular Parque Nacional de Ordesa y Monte Perdido – containing several of the tallest and most beautiful mountains in the entire Pryenees and 2 of Europe’s deepest and longest canyons. Afternoon on your own to relax and explore Torla. 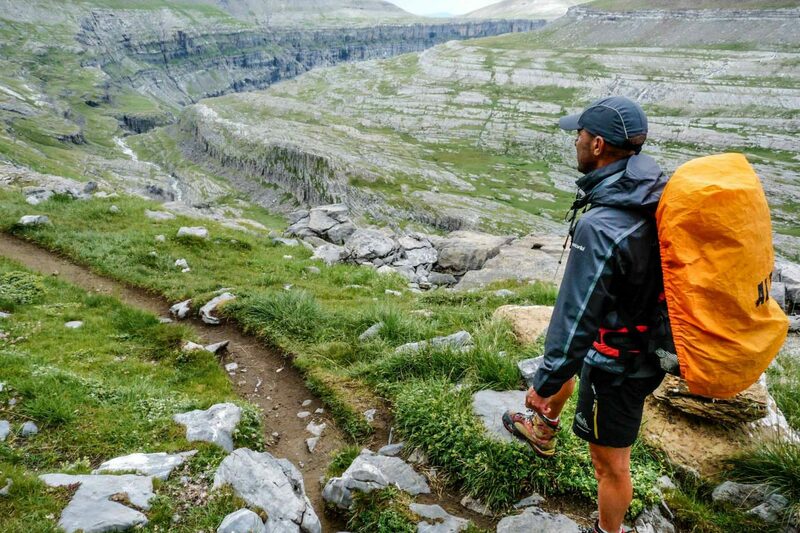 Today’s hike is a great introduction to Ordesa Canyon as we hike one of the most attractive routes in the National Park on a spectacular trail via a characteristic natural ledge-like feature called a “Faja” – running high along the canyon walls. On this hike you’ll experience wildflowers galore and a succession of lovely waterfalls. Today’s excursion is a fitting finale to our adventures as we trek to the beautiful Cola de Caballo (Horse’s Tail) waterfall, one of the highlights of Spain’s most famous Pyrenean national park. We’ll have perfect views of the main ridge comprising Mt. Perdido and many other 3,000 m peaks. 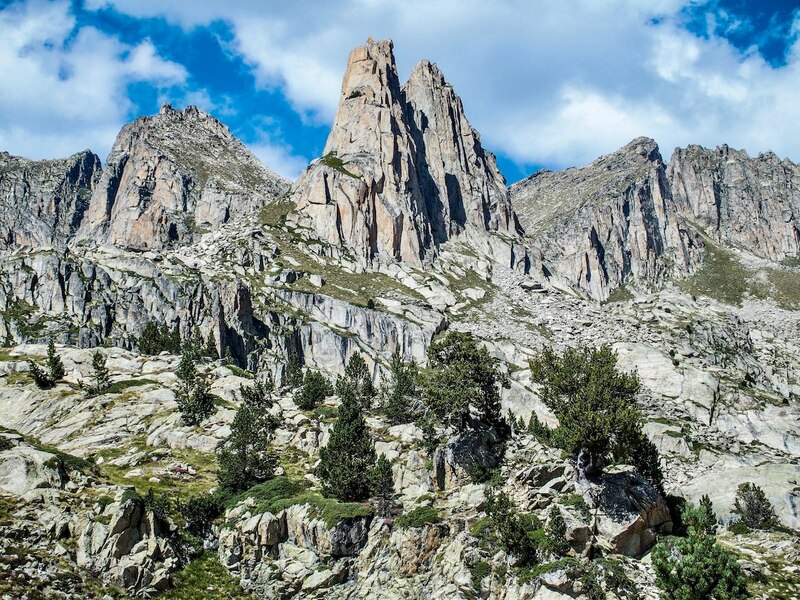 Fauna you are likely to see include marmots, chamoix and the Lammergeier – or Bearded Vulture, one of Europe’s rarest birds of prey, which makes its home here in Ordesa. The tour officially ends after breakfast, with a transfer to Bilbao, in Spain’s Basque Country on the Atlantic coast. On the way we pass through Pamplona and San Sebastian where you’ll have the choice of getting off. We can book hotels for you in any of these 3 cities.